In today’s podcast we interview one of the contest winners from a past Adonis Index transformation Jason Haynes. Jason made a dramatic change over the course of two contests and his transformation has influenced and motivated many others to commit to making a real change in their body. Jason will share some of the insights he gained from losing almost 60lbs to fundamentally change the look and shape of his body. Jason knows what it takes to make a big time change! He’ll also give you some tips and advice on what to expect when you decide to take the next step with your body and how others will react towards you. And make no mistake about it. The same hurdles, and barriers exist for men and women so the information Jason is sharing is seriously valuable. This is a social and psychological exploration of what it’s like to make a big time change in your body and how to deal with other people and yourself once you’ve got to where you want to go. This is also a bit of mental preparation for those of you who are going to be entering the first ever Venus Index Transformation Contest! So listen up this is a good one! I think for women, goal hijacking comes in the form of them just not knowing what they would like their end result to be or exactly how to get there. There’s just so much info (wrong) out there that it’s hard to siphon through it all. You also have many people pushing abs & cardio. Most women just don’t realize just how difficult it is for them to develop muscle so they are afraid of “bulking up”. Women seem to have more problems getting rid of “flab” because they don’t want any part of weight training. Most expect to see results immediately and don’t realize it just doesn’t work that way. You didn’t put it on in a day and your not going to take it off in one either. I think goal hijacking for women happens much in the same way as it does for men. Guys want to be bigger. Girls want to be shapier (is that even a word? -LOL). Yeah, there are a lot of variables that go into all of this and unless you really get crystal clear on where you want to go… it’s easy to get lost. The human mind can only manage about 6-7 variables at one time (this is the reason local phone numbers are 7 digits), anything higher and confusion, stress, and overwhelm kick in. I knew I wanted to continue to improve my body image, but wasn’t quite sure what I was looking for or how to get there. I had inadvertently pretty much gotten my shoulders and hips to what my VI is and my waist is almost there too. I think with VI’s specific exercises I can achieve the goal I didn’t realize I was working towards. If you know what I mean! Makes total sense and very good insight. Thanks guys! 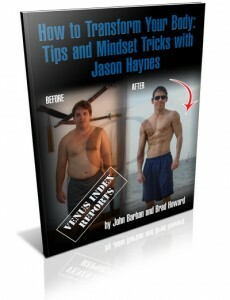 Jason is an inspiration and looks fantastic! And yes, with VI it’s great to have something to actually aim for now instead of just a vague idea of “losing weight” or “toning up”. Excellent point about goal hijacking but there is also a lot of truth in the “I will know it when I see it”. However for me, the most critical thing in this discussion is peer support, or lack of it. It is true that we typically are effected or emulate the behaviours of those closest to us and when we try to change it is difficult for everyone involved. I was also wondering if it is more difficult for women to find peer support in trying to achieve a major body transformation than it is for men. In my experience, I have found both cultural and gender differences. Let me explain. In HK I have both Chinese and Western friends. Both male and female Chinese friends are extremely complimentary and supportive. They genuinely want to know what I am doing and if I can help them. I often have Chinese males at my gym tell me I look awesome and how much they have seen me improve over a time period. They want to know about my program, diet and what they can do to improve their results. …… and then there are the Westerners. Interestingly Western males will constantly ask my husband what he is doing as he looks great (and he does). He will always say to ask me given I do all our programs and diet, food prep etc. However, not only will a western male never ask me or compliment me (unless it is way toooo inappropriate) but even when they are 30kg overweight, they will tell me all the things I am supposedly doing wrong. I just cannot have a supportive discussion. I frequently find many of my western females friends resorting to saying fairly snide and jealous remarks about how I eat or that I am too muscled (hardly) or that I am insane (get this one a lot, I must remember to stop dribbling in public). There is also a lot of the “cake offering” going on too. What is interesting is that not only do they consider it acceptable to comment negatively about my weight (or lack thereof) but to extend this to other areas such as dress sense, intellect, the car I drive…… wow. I am finding having a lot of negative energy in my life is really debilitating and it is so stupid because it comes from me trying to be the best I can be. I am not competing with anyone and I would gladly help or support anyone who wanted to change. Anyway I have started to pick people up on this by saying “and how would you feel if I told you how I felt about your weight”. I guess I just need to find some more positive and supportive people to hang out with……. On another interesting note, I have the exact opposite experience to Jason in HK and that is it is much easier for me to avoid ‘bad’ carbs than in the west. You bring up a good point that I neglected to talk about: culture differences. It’s so funny, but when I was fat, my Chinese friends, coworkers, and students would all say things like “you’re fat” or “You’re a little fat,” but my foreign/western friends would never say that. Maybe not even think it. But when I lost fat, my chinese friends were VERY supportive and complimentary. Lot’s of compliments and “amazing” (Li hai) kinds of things. Guys at the gym were always asking how I did it, and were very supportive afterwards. Yet at the same time, my foreign/western friends were all like: “You’re just going to gain it back,” “Yo-yo dieter” and all that stuff. You gotta learn to be proud of yourself and help lead those others (if they want to be led). As we’ve said before, most of them desperately want to make a change and are just threatened by your success (juxtaposed to their lack of movement). I think you both already know it’s not about you, and their negative arrows directed at you are in an effort for them to protect their own feelings. Thanks you for your response. I have a final thought on this. In Australia we have a well known cultural response we call the tall poppy syndrome. It is prevalent now, and with both my parents and grandparents generation (maybe earlier???). It means that if you dare to be better than the accepted norm you will be cut down as all tall poppies are. We use this in everyday speech where we shorten it to tall poppies or, “that is just tall poppies”and you are jealous. I think this predates PC but certainly is a drive to mediocrity. I guess now in many western countries being overweight or obese is the norm and we are all being PC by not commenting and indeed subsidising it but if you dare to be lean and fit then maybe you are just a tall poppy. LOL on Jason’s statement about the Chinese saying it as it is….. you are fat. A number of my friends complain that every time they go into a clothes shop they get told “Too fat, no clothes for you here”. Why do men dress up? For women. Honestly, as you grow as a person, you’re going to naturally gravitate to others that are growing as well… it just happens. It’s just the nature of the beast. Ha, had to jump in here, as I have a theory for why women are unsupportive of one another here in the west : has anyone every talked more about what our (US) media really does to people? Every TV show, movie, commercial, always has women complaining about how they look. Or they are portrayed as vipers who trash their pretty friend when she’s not around. Think about it; Christian Bale or Jared Leto are commended for bringing their bodyfat down to scary levels to emulate a starving person, yet a woman is expected to be that thin for the chance to have 4 seconds of screentime as a waitress. * Turn off your damn TV and quit reading about how celebrities drink water and do pilates to achieve their looks. *Plug your ears up when someone says your metabolism will slow down, or that you’re not eating enough, or that you need to eat all day to rev up that metabolism. *Realize it’s ok to toss food if a place has served you a gigantic proportion. Hopefully you have the will power to save it and eat it another day, though.